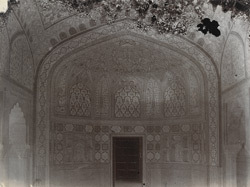 Damaged photograph of the interior of one of the two 'shish mahal' or glass palaces, within the private palaces inside Amber Fort, taken some time in the 1880's and attributed to Henry Hardy Cole (probably incorrectly). The fort was begun by Raja Man Singh (r. 1592-1615), but the major palace constructions occurred in the seventeenth century, before the fort was finally abandoned in 1727. The 'shish mahal' chambers - the Jai Mandir on the ground floor and Jess Mandir above - form part of the private residential quarters reserved for the male members of royal family and court. This view shows detailed mirror mosaic and inlay work in floral patterns and vase and jar motifs on the wall surfaces.